Length: 18 hrs. 41 min. "I wear the black for those who've never read or listened to the words that Jesus said." "To turn the written Word into the spoken Word has long been my dream. As I read the words of the Lord I prayed to feel and show only His love with a clear deliverance of His messages, constantly aware that He is speaking to me, and that when I am reading His words, I am not Him." 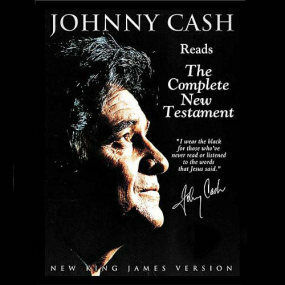 "I chose the New King James Version because it retains much of the beauty and classic prose and poetry of the original King James Version, yet is easily understood by those who might have said, 'I've read the Bible but don't understand it.'" "Give it a try and share with me a new dimension of blessing in the spoken Word."